For lots of reasons. (I've hinted at things previously, I just wasn't ready to write about it.) I feel positive that going is the right move for me at the moment, but I will still find it hard to leave. 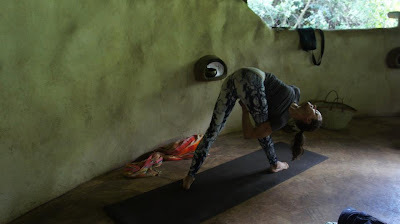 My yoga teacher, Oriane, is a teacher in every sense of the word. She challenges me in such a caring way and is passionate about sharing her knowledge with others (she also is good at making me feel bad if I don't do my homework...!) As I run, every yoga session leaves me breathless, telling my knees to just 'relax'. But these sessions have been one of my favourite things about living in Nairobi and I will truely miss them. Not just becuase of the yoga, but because of the friends I have met through the classes. If you are looking for a teacher in Nairobi, she it the best! (Her website). I have been so blessed to meet such amazing people during my adventures here in Africa. I'm sad to hear you are leaving, I was enjoying following your blog, but you have to do what is right for you. I'm sure your next adventure will be equally as good where ever in the world that is. Oh darn! You are leaving? Where you are heading next!? I hope wherever it is, you have as good a time as you did in Africa! Part of me is sad you are leaving. I have transported myself to that place as I read your posts. Can't wait to see what's in store for you. I am excited to see what's coming next.... but it will be hard to leave and for that I'm sorry! Big changes afoot! Where are you going? Best of luck to you. Looking forward to following along on your next adventure. You are leaving? That's a big change? I can understand that you are sad! I am thinking of you and can't wait to hear about your plans! thanks katrin-not sure what i am going to do with my blgo...a new name for sure! Wow! What caused you to make this decision? I'd love to hear where you are heading next? Ali Mc- yes it was quite sudden, although i have been thinking about it for a while. Laura-lots of reasons-but pretty much all work related. thanks Laura - not sure how 'adventurous' the move will be...but I will try and tell you about them all the same! Wow, like some of the other commenters, I'm a little surprised. You are not the only blogger I follow that is moving country, however. Good luck in whatever you do! thanks paul-a hard decision to make, even I am a little surprised!